Warrior, hero and King: Beowulf was all three to the people known as the Geats. Beowulf, hearing of King Hrothgar’s troubles, comes to the King of the Danes to rid him of the monster, Grendel, who kills the humans in the mead hall every nightfall. He lays in wait for Grendel – minus his mail, sword and shield – and attacks the beast bare handed, tearing off his arm. Grendel flees to his mother’s lair to die. In her rage, his monstrous mother comes to the mead hall to enact her revenge, kidnapping and killing one warrior. So Beowulf goes to the lair beneath the rancid waters and swims to her den. There he takes a sword of the giants and kills her, beheads the dead Grendel, then leaves. Beowulf was rewarded for his great deeds and eventually became the King of the Geats. In his twilight years, a dragon sought revenge on the people because a servant stole a golden cup from the dragon’s hoard. So Beowulf donned his sword and, armed with a new shield specially designed to withstand the dragon’s fire, Beowulf went to destroy the beast. On that battlefield, Beowulf declared war on the worm and there they fought. His fearful men retreated save one, but Beowulf was fatally wounded. After the dragon was destroyed, Beowulf gave his possessions and kingdom to Wigluf, his faithful warrior, and was then burned in a funeral pyre and his remains buried in a barrow for all to see. Such is the story of the great Beowulf. This is the BEOWULF title to use for elementary children, plain and simple. It tells the tale of BEOWULF but does so in such a way that does not talk down to students and is still appropriate for them. I have read and reviewed other BEOWULF adaptations and this version stands as tall as the others. The only difference that I noticed is that in this version BEOWULF swims directly to the she-beast’s lair without incident or intervention. The language is modern but still maintains a hint of antiquity in both vocabulary and grammatical structure – just enough to add flavor to the story but not derail young readers. The illustrations are artfully crafted to depict the story with very little bloodshed being shown, which is significantly different than some other versions. This reflects the intended audience of the book: students in public schools. As is common with the Graphic Universe series, the colors are bright and vibrant. The illustrations are rendered in a realistic style, which is typical of American comics. There are details in both the foreground and background as well with the characters. To teach traditional literature in a classroom, one simply need open this graphic novel. Kids will be interested and engaged. In fact, many students will be eager to write their own action-adventure-fantasy stories after reading BEOWULF. There is so much a person could do with this text, including discussions on Scandinavian cultures and the influence of the culture on European (and American) culture. Certainly the hero mythology could be deeply explored using both traditional and modern heroes. Students could also come up with their own hero stories. The good people from Lerner Publishing have included all kinds of goodies at the end of the book. They offer a glossary, pronunciation guide, information for further reading (text and Internet), and a brief description on the creation of this adaptation. 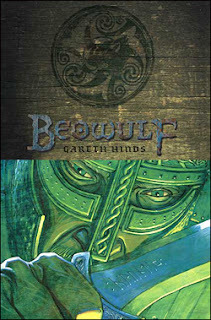 I think this particular version of BEOWULF is the best choice for an elementary classroom. Depending on the school and the community, it may be the best choice for middle school as well. The story is accurate to the original text and is still very accessible to students and appropriate for the classroom. You nonfiction lovers out there will be thrilled to see what has come into the classroom this week. Everything poured in: biography, history, science, minority culture, and pop culture. Interestingly enough along with these nonfiction books came two DVDs which coincide with two titles. They are so impressive that I have contacted Capstone Press about the intereactive CDs and have set up an interview. By the first week of January, expect a great story on how you can bring graphic novels and technology into your classroom in an exciting and engaging way. If that was not enough, guess what else hit the shelves this week? Only a graphic anthology adaptation of my all time favorite writer, Mark Twain. I’m giddy with anticipation. Can you believe it? Another adaptation of BEOWULF came into the classroom this week. This one published by Lerner, is aimed at a younger crowd. 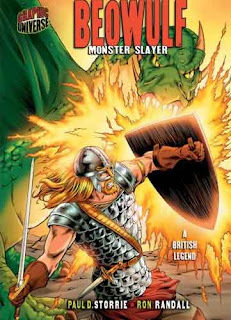 Because of the movie tie-in it will be reviewed next week, which should conclude my series on Beowulf. I do not know of any other comic adaptations. The TREASURE ISLAND series concluded this month with issue number 6. I have not read any of the issues yet, but I hope they are good and appropriate for the classroom. An interesting comic (THE CLOCKWORK GIRL) by Arcana Kids publishers also came out this week, selling for only 25 cents. The entire issue is available for free download here. This is listed as an all ages book and proves to be interesting. I received two titles from First Second Books. This publisher has put out some really cool titles so far, two of which can be read here and here. What a week! I attended the book talk on Jewish graphic novel literature at the university on Wednesday night. We discussed the Pulitzer Prize winning graphic novel, MAUS, for an hour and a half; that was not nearly enough time. The book truly was a force to be reckoned with. I’m working on that review as well as the reviews for both BEOWULF adaptations all at the same time. I’m also reading the entire BONE series. There is some great stuff in the pipeline coming your way. Eureka Productions is pleased to announce the publication of the revised second edition of the long-out-of-print GRAPHIC CLASSICS: MARK TWAIN, the eighth volume in the GRAPHIC CLASSICS series of comics adaptations of great literature. This edition contains 38 pages of new material, including a never-done-before comics presentation of “Tom Sawyer Abroad,” Mark Twain’s little-known sequel to “The Adventures of Huckleberry Finn,” with adaptation by Tom Pomplun and George Sellas. 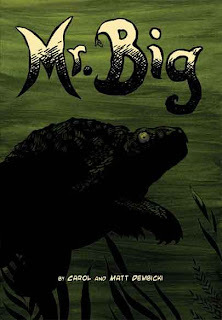 Returning from the first edition are “The Mysterious Stranger” by Rick Geary, “A Dog’s Tale” by Lance Tooks, “The Celebrated Jumping Frog” by Kevin Atkinson, and “The Carnival of Crime in Connecticut” by Antonella Caputo and Nick Miller. Also “Is He Living or Is He Dead?” “A Curious Pleasure Excursion,” and eight women artists interpret Mark Twain’s “Advice to Little Girls.” With a dramatic cover painting by George Sellas. GRAPHIC CLASSICS: MARK TWAIN is available for schools and libraries from Diamond Distributors, Baker & Taylor, Ingram and other distributors, in bookstores, or direct from the publisher at http://www.graphicclassics.com. King Ethelbert is a snotty, spoiled little 6-year-old with a flair for the exciting. As king, he can do whatever he wishes putting the adults at his beck-and-call. Typical of youth, he is self-centered and unconcerned with the feelings of others. His biggest concern is competing for riches with his cousin-king from around the bend. TINY TYRANT is about more than a spoiled child. We have a dandy little yarn about what life would be like if kids were in charge, really in charge. King Ethelbert gets the grown ups and put them into all kinds of predicaments; kids will eat it up with a spoon, and they will see Ethelbert for what he is – a spoiled rich kid. Still, it is great fun to pretend that they are Ethelbert and bossing all of us around. The most distinctive aspect of Parme’s art is the fact that he uses frameless (or borderless) panels in his illustrations. Some will enjoy the free flowing movement this technique implores; others may be confused by it. The sequence of panels is virtually the same on ever page making the frames unnecessary. I found the technique refreshing and very pleasing to the eye. Parme also uses different background colors for each chapter, something that I found worked quite well. Many children and adults will check to see how long a chapter is before reading it. The colors make that very easy to do. I found the illustrations to be absolutely fantastic: clean, clear, precise, and most importantly, the art added more to the story than was found in the text alone. There is some mild wrestling-style, Looney Tunes violence, but nothing that the majority of parents would object to. TINY TYRANT lends itself to companion reading. I think adults and kids can sit down together and read about the hysterical antics of Ethelbert and then talk about how he acts naughty. Described as an anti-hero, Ethelbert is our what-not-to-do role model. Kids understand; they get it. They will not have problems with understanding why they cannot act like Ethelbert. I think it would be a great discussion to talk about why his actions are misguided. What would happen if we acted like Ethelbert at school? What’s wrong with acting like him? Why shouldn’t we all act like Ethelbert. I see a journal entry, classroom blog post, class discussion, or essay in the future. 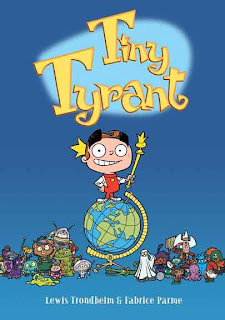 Come to think of it, TINY TYRANT may be just the perfect book to read to students within the first week of school, when we teachers are talking about classroom rules and appropriate behaviors. First Second keeps putting out interesting and unique graphic novels for children. Their stories are not the typical superhero fare, expanding the genre and giving readers choices of what to read. I love it and hope they keep it up. TINY TYRANT is great and lends itself to a great discussion on proper ethics and behaviors. It does so without preaching or lecturing to the students. For that very reason, this title gets a “Highly Recommended” from me. 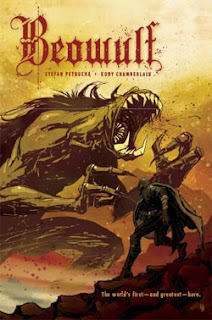 This is the second week in a row that a graphic adaptation of BEOWULF has made its way into the classroom. As you are probably aware, a movie adaptation is also due out next week. Movie versions of literature (traditional or comic) should spark students into a deep compare/contrast discussion in a classroom. So I am working on those reviews, and maybe more, in the coming days. Because my university is hosting a book talk on Jewish graphic novel literature, I am reading some of the pieces. MAUS came in this week and I finished both books. Look for this review in the near future. I'm a student in the Children's Lit MA program at Simmons College (in Mass), and I'm doing some research for an independent project on the relationship of graphic novels and other graphic works to theater/live performance. My idea was that since plays and graphic novels are both mostly dialogue or narration by a specific voice, that there should besome relationship between the two. Apparently it's kind of a stretch; I haven't been able to find any actual graphic works that are about theater, though I have found some about other kinds of live performance, nor have I found any graphic adaptations of theater (as opposed to the multitudes of graphic adaptations of movies). I've been reading (and enjoying!) your blog for a while now, and as I get further into my research I plan to sift through your recommendations there to see if anything fits what I'm looking for, but I wondered if you know off the top of your head of any graphic works that relate to theater or to other kinds of performance. I'm sure you're swamped with stuff to do, but anything that comes to your mind would be helpful. Hey Rachel, thank you for the email and the nice comments. There are plenty of graphic adaptations of Shakespeare's works. (I directed her to many of those, which can be obtained from Amazon.com easily enough.) I just did a Google keyword search for "Romeo and Juliet comics and found several. I'm sure there are other adaptations by other writers. I am not familiar enough with plays to be able to search for them. If you can help Rachel, then leave comments or email me (abikerbard@mac.com) and I will forward them to her. Also, please do not hesitate to contact me with your questions. You can always leave comments or email me privately. My university has a book discussion group about Jewish literature in graphic novel format. What a great idea. I can't believe I missed this. Thanks to Anne M. Baker, Archivist at the Missouri State University for alerting The Graphic Classroom. I love it when folks look out for me. The graphic novel is an exciting new form of storytelling. Here, five Jewish artists experiment with words and pictures to tell stories of childhood, war, and desire; to conjure up lost worlds, both real and imaginary; and to contemplate history, myth, and the individual psyche. All programs will take place from 7:00 p.m. to 8:30 p.m. on Wednesday evenings in the Curriculum Resource Center, Meyer Library on the Missouri State University campus. For further information, see the flier. Interested readers are encouraged to register by contacting Cherri Jones at 417 836-4546 or cherrijones@missouristate.edu. Ms. Mara Cohen Ioannides, Jewish scholar and Instructor of English at Missouri State University, will serve as discussion leader for the series. Refreshments will be served at each event. Parking passes will be included in each participant’s registration packet. Let's Talk About It: Jewish Literature — Identity and Imagination, a reading and discussion series, has been made possible by a grant from Nextbook, the American Library Association and the National Endowment for the Humanities. Local support for this program is provided by The Springfield-Greene County Public Library and Springfield Public Schools.